Background: Boswellic acids (BAs) are extracted from oleo gum of Boswellia serrata and are utilized as potential anti-inflammatory, hypolipidemic, immunomodulatory and antitumor specialists. The present examination was meant to assess KBA and AKBA in Boswellia serrata separate by High-Performance Thin Layer Chromatography (HPTLC). Methods: The separation of bioactive compounds was performed utilizing mobile phase glacial acetic acid, n-hexane, ethyl acetate and toluene (0.3: 1: 8: 2) (v/v/v/v) and distinguished at wavelength 254 nm. The technique was approved for linearity, precision, accuracy, limit of detection (LOD), limit of quantification (LOQ), and so forth by International Conference on Harmonization guidelines. Results: The calibration range was observed to be 2- 14 μg/band for both the bioactive compounds. KBA was isolated with an Rf estimation of 0.39 ± 0.02 and AKBA with an Rf estimation of 0.42 ± 0.02. The accuracy was seen to be as high as 99.17% and 97.42 for KBA and KBA, respectively. The percentage RSD value for intra-day and between day varieties was under 2%. The system indicated high affectability and specificity. 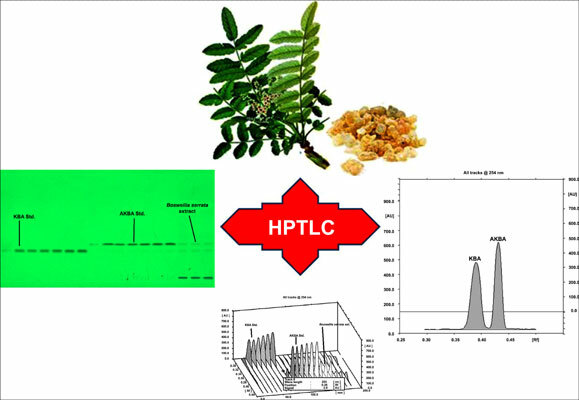 Conclusion: The developed HPTLC method was simple, precise, robust, specific, rapid, and costeffective and could be used for quality control analysis and quantification of KBA and AKBA in different herbal formulations containing the plant species. Boswellia serrata, boswellic acids, HPTLC, method development, quality control, validation.